About 20 people were killed and dozens wounded Friday in a string of explosions near a popular hotel in the Somali capital Mogadishu, police said. “We are getting (information that) about 20 people died in the attack and more than 40 others were wounded. Most of these people were civilians who were passing by the area when the attack occurred,” Abdulahi Ahmed, a Somali security official, said. Twin car bombs exploded in the capital within moments of each other, followed by gunfire and a third blast, sending thick plumes of black smoke into the sky, according to an AFP reporter.Mogadishu faces frequent bombings at the hands of Al-Shabaab, an Al-Qaeda affiliate which has been fighting to overthrow the internationally-backed Somali government for over a decade. The blasts occurred near the Sahafi hotel and Criminal Investigation Division (CID) police headquarters. 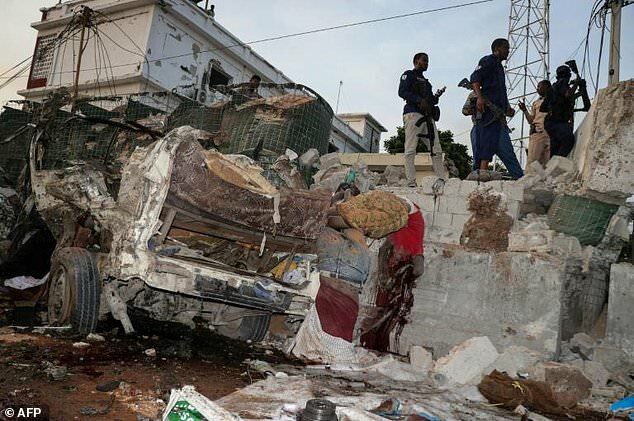 “The target of the attack was the Sahafi hotel and even though the attackers used car bombs to make their way into the premises, the security forces stopped them,” said Ahmed. “All of the four Shabaab attackers were killed outside” the hotel building, he stressed. An initial “two blasts struck the perimeter of the Sahafi hotel along the main road,” said police official Ibrahim Mohamed, who earlier gave a preliminary toll of more than 10 dead. Witnesses said a third blast came from a suicide bomber who detonated an explosives-laden vest at the hotel’s front entrance, as three attackers in Somali military uniform were shot at the rear entrance. Abdulkadir Abdirahman, director of Mogadishu´s Aamin ambulance service, earlier said his team had recovered 10 bodies and 40 wounded. But Bashir Hassan Farah, another ambulance medic, later said he saw 20 dead bodies, most of them civilians. According to sources, the fatalities included the son of the owner of the hotel, Abdirashid Ilqeyte, who was killed in a Shabaab attack on the establishment in November 2015. The bombs destroyed parts of the hotel perimeter despite layered security, and several shops and other buildings nearby were destroyed. Sources said several civilian minibuses and rickshaws that were passing by when the blast occurred, were destroyed and passengers killed and wounded. “There was chaos after the blast. Some of the vehicles were buses, which caught fire. I could see people screaming as they fled the buses,” witness Fadumo Ali told AFP. “This area is always dense and traffic jams are normal. This increased the casualties. 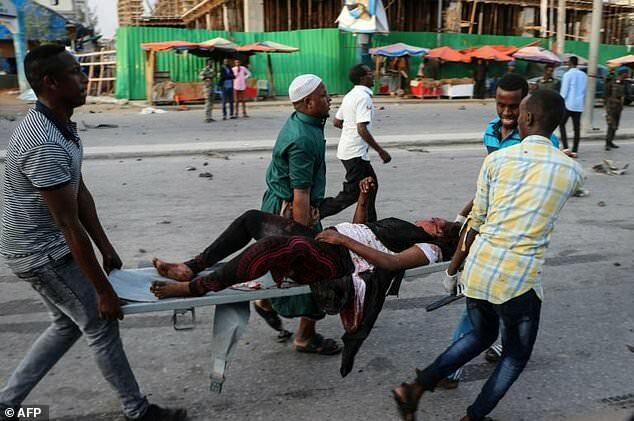 Most of the dead and wounded were civilians,” added Awil Mohamed, another witness. 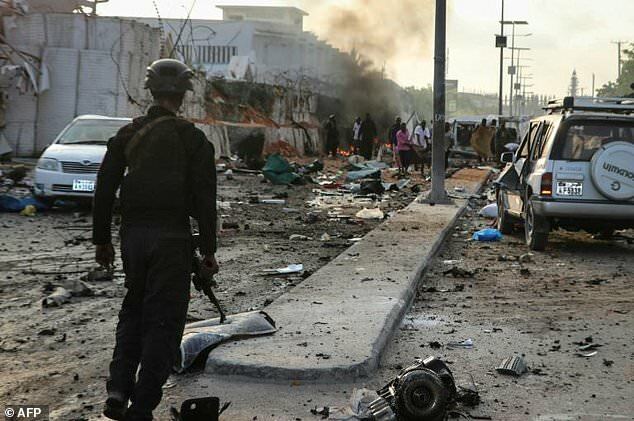 “Armed members from the Shabab Al-Mujahideen carried (out) a complex attack targeting Sahafi hotel in Mogadishu where senior Somali government officials stay,” the militant group said in a statement quoted by a pro-Shabaab website. The Shabaab were forced out of the capital by African Union troops in 2011. But they still control parts of the countryside and attack government, military, and civilian targets, seemingly at will, in Mogadishu and towns in the region.